The Dynasty Harmony 44-Inch built-in electric fireplace is a perfect contemporary addition to any room with its stunning linear design and realistic flame effects. 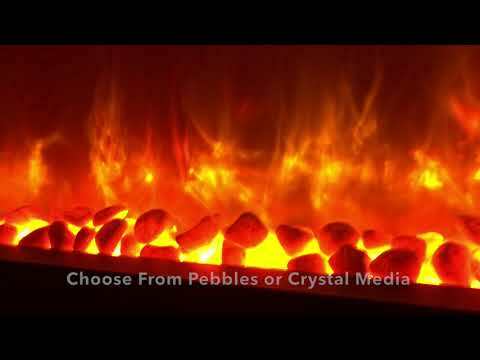 Choose the look of your ember bed with the included Pebble and Crystal media. The LED flame effects can be either the traditional orange and yellow flame, or a gorgeous blue for a more modern feel. Choose from 4 unique flame effects to perfectly match your mood. Featuring a supplemental heater, operating at 1300 Watts and 4400 BTUs, that allows for some added warmth for areas up to 300 square feet, making any area nice and cozy. You have the option to plug the unit into a standard 120V wall outlet or hardwired directly to your homes electric grid based on your needs. With a front facing heater vent, installation is simple and requires no clearance above the unit providing the freedom of mounting anything from shelves to televisions. Rounding out the features is a multi-functional remote control that can adjust the flames, heat, temperature, and on/off timer from the comfort of your couch. 44" 51 3/16" 50" 40"
300 Sq. Ft. 150 Sq. Ft. 400 Sq. Ft. 1,000 Sq. Ft.